4 months 2 weeks ago	#594 by Pascale R.
How do I delete a "user-Refined letter" setting? was created by Pascale R.
I edited a letter & saved it with the "user Refined letter" tool, and need to delete it. How do I do that? The delete button is not active. 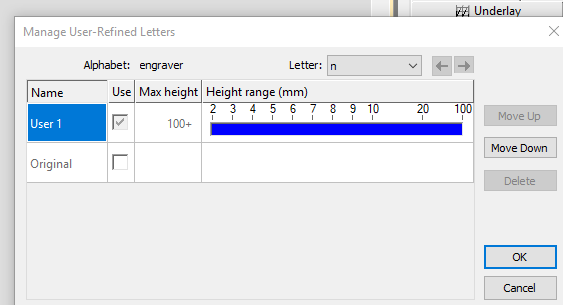 On some alphabets, I noticed that I have multiple users in the Manage User Refined letters. Can one have multiple versions of one letter? And if so, how does system know which setting to use when "Used Saved Version" is selected? And, how did I manage to have two different 'pages' for one letter? Replied by brenden on topic How do I delete a "user-Refined letter" setting? You can't delete it as you always need to have one version enabled and you've turned off the 'Factory' default version. So check on to use the 'Factory' version, then you will be free to select your user defined version and delete that. 4 months 2 weeks ago	- 4 months 2 weeks ago	#601 by Pascale R.
Replied by Pascale R. on topic How do I delete a "user-Refined letter" setting? Thanks Brenden. I now know how to delete a setting. And, I believe I've figured out how to use multiple versions of a letter ! Yeah! Are User-refined changes saved with the esa ... so that if someone else buys the esa they will also have the different user refined settings? this is something Lindee had asked in another post. Brenden >>> Could you also take a look at this thread https://community.wilcom.com/embroiderystudio/187-font-creator-additional-swashy-characters"Font Creator & additional "swashy" characters " under Embroidery Studio Category. It was started by Lindee and I believe I may have told her incorrectly, but I'm still unsure how to use two different letter settings of one letter in one text object. Is it possible? Thanks!